I have written a number of articles about the drug price control policy in the country since 2009. So last February 15 this year, I curiously tried a simple test: did any of my articles and blog posts about the subject manage to land on page 1, or the Top 10 articles, of the 3 major search engines, Bing, Google and Yahoo? 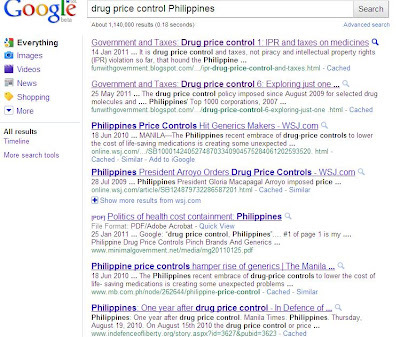 I was surprised of the result, I blogged it here, Drug price control 4: Blog popularity in google, yahoo and bing. In summary: in both Bing and Google, 2 of the top 10 articles there were from my blog articles; and in yahoo, not one blog post landed in the top 10, but two of my long papers on the subject, posted in the MG website, landed in the top 10. 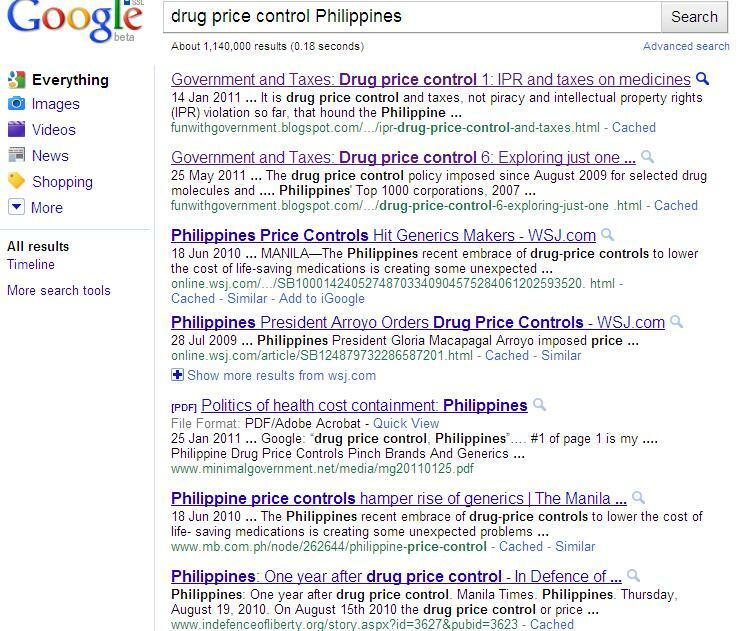 Today, I checked again if this blog is able to retain its position in the said 3 major search engines when one will search the topic, "drug price control". Here are the results. 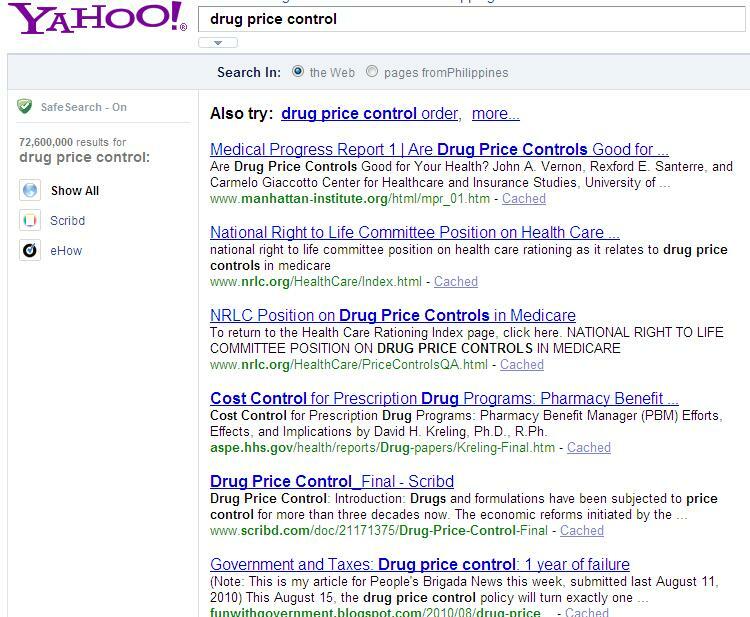 In Bing, Microsoft's search engine, #s 6th and 7th were my papers, "Drug price control: 1 year of failure" and "Drug price control 5: Mandatory discounts", respectively. 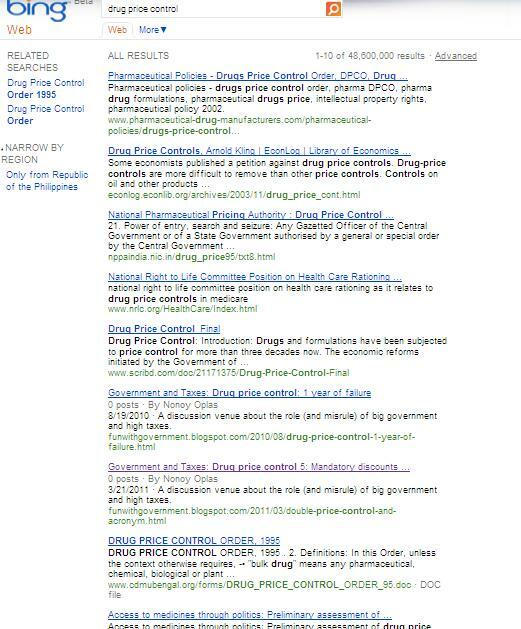 And #9 is my long paper (35 pages including annexes), "Access to medicines through politics: Preliminary assessment of the drug price control policy in the Philippines", posted in the MG website. Good result, 3 out of the top 10 articles in Bing were my papers. 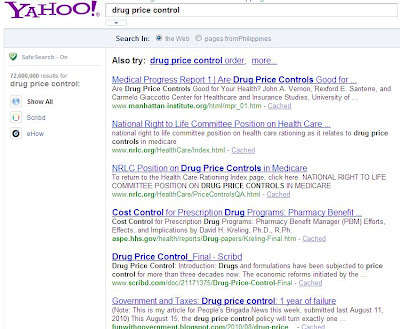 In yahoo, only 1 paper from this blog managed to land in the top 10, #6th, "Drug price control: 1 year of failure". Going to page 2, my other paper landed #12th, "Drug price control a year after". 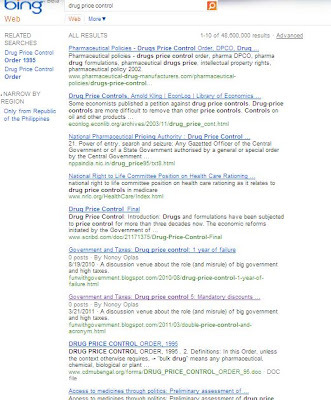 #1 is "Drug price control 1: IPR and taxes on medicines", #2 is "Drug price control 6: Exploring just one price for each drug", #5 is my longer paper posted in the MG website, "Politics of health cost containment: Philippines", and #7 is my paper, "One year after drug price control", posted in the Liberty Institute (India) website. Yeah! The policy will turn two years old within two months, in mid-August 2011. There are no signs that the DOH will remove or recommend to the President to recall the policy. Well, damage has been done, both short-term and long-term, to the country's investment policy. That if you invented a popular, more disease killer but still patented drug, and if you bring it in the Philippines, expect that the politics of envy will gang up on you, and your drug can be put under price control. Or it can be issued a compulsory licensing (CL). One implication of this is that some newly invented, more revolutionary but still on patent drugs, may not be brought into the country. Only when the patent is about to expire or has expired, meaning a few years after where generics production can be introduced, that the drug will be brought to the country. I have discussed this subject more elaborately in Drug price control 9: More comments on single pricing per drug. Is Asian democracy in crisis?